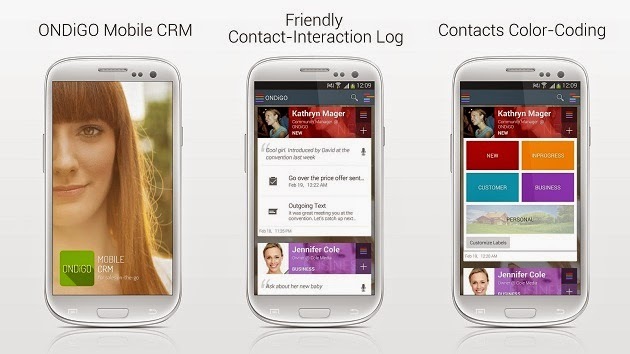 Ondigo Mobile CRM is one of the best business applications you can find on the internet today. This application installs on your smartphone and makes your life easier if you are a person who has to manage a lot of contacts and notes associated with those contacts. This is a perfect tool for sales persons who have to keep a detailed record of every customer along with the record of every interaction with the customer. This software is not only good for individual sales persons but for small businesses for making the most of its sales and marketing workforce. What Does This Application Do? Ondigo Mobile CRM travels with you and allows you to stay on top of your sales and contacts on the go. It installs on your smartphone and allows you to create a contacts’ book. With this app, it’s easy to add notes and other important information with the contacts that you have on your contacts’ book. Give colors to the entries so to know the type of customer or level of priority. You don’t always have to make manual entries on these contacts as the calls, emails and other communications are automatically recorded with the contacts. This is one of the most user-friendly business applications you can install on your smartphone. The purpose this application serves can hardly be served by any other business application. Being able to have a separate database of your customers on your smartphone is one big relief for small businesses. Furthermore, you can store all the necessary information about these customers on your smartphone using this wonderful application. Not only can you add notes with the contacts but you can also attach files, check progress of sales, set priorities and schedule events too. Cross platform access, salesforce features and the ability to operate collaboratively are some of the amazing features that are scheduled to be introduced on this mobile CRM. Small business owners will not have to worry about lost potential leads and customers just because their sales people weren’t able to take information of the customers on the spot. Ondigo Mobile CRM now allows all sales people to make notes, set priorities and schedule meetings with the customers right away. Once the customer is in the mobile database, every form of interaction and communication to and from the customer is automatically logged into the CRM. A link to the download page is here.